With all the negative press in the world of Porsche this past week I thought it was time for a lighthearted story. Fortunately, a Porsche owner (Russ) in Woodland Hills, California and a wildlife rescue group named Animal Advocates provided us with one. Here's there story in an email exchange about a little surprise Russ found waiting for him in his Porsche Boxster. Russ: I live in Woodland Hills. Yesterday I saw a squirrel using only his two front legs to crawl across the street. Obviously he was hit by someone's car. I helped him to the side of the road and protected him with my car covering him so other cars would not hit him. He then soon afterwards climbed onto the rack and pinion of my Porsche under the front of the car. I drove a half mile to my garage in hopes of getting him out and to help. I tried poking gently, and many other ways during the day. It has now been 24 hours and I had others try without hurting him but to no avail. I even had a tow truck come but the squirrel was too hard to get to without putting the car on garage racks. I now put peanut butter in the garage hoping he will come out and let me help him. He is a able to come out if he wants to. I'm afraid he will die in there. I've even tried hosing him but that didn't work. Any ideas? He is frightened. He's also most likely paralyzed. It could be temporary or permanent. Sometimes a fractured pelvis will cause them to appear to be paralyzed. He will wedge himself in there and not leave until people aren't around him. If he can't urinate because of his paralysis, he will die in 24 hours. They do LOVE peanut butter. You can put peanut butter on something say three feet away from the car in a safe area like a box. You need him to get out of the car and to stay out. We use Havahart traps set with peanut butter to humanely catch them. I also use small nets for birds and small fish. If you try to grab him even with leather gloves, the teeth will go through it. Do NOT try to grab him from his tail. It will deglove and you will end up with his tail skin and fur in your hand. His tail will then die and fall off. I sometimes will blow on them to get them to move. He will move away from you blowing. Good luck. Russ: Thanks! The tow truck driver couldn't believe this either. AA: Your car was the safest and closest hiding place for him. When they are injured, they want to hide so predators can't eat them. I've had to get them out of all sorts of crazy things when they hide. AA: Russ and I met up in the parking lot of Whole Foods. I transferred the squirrel to my crate. 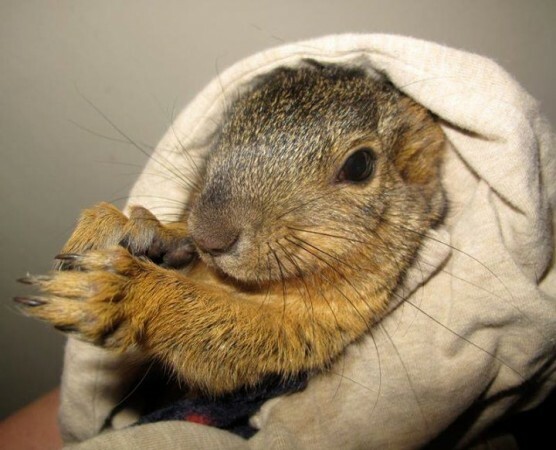 The squirrel is almost a year old female Fox tree squirrel. She can urinate and defecate on her own. There is slight movement from the toe pinch test. Good signs. We will give her supportive care, a great diet, anti-inflams and limit her movements. Fingers crossed for a full recovery. Here is the Porsche Boxster where she got stuck. Engine is in the back. She crawled up the front tire and into the front under the trunk. Not only does Porsche the squirrel have great taste in cars, she got lucky that the engine is in the back. She might not have survived if the engine was in the front. Russ drove to his home and then again to the dealership with her in there. She's in good shape though a tad dehydrated and very tired. I gave her fluids and now she's fast asleep on a crate with a heating pad underneath. I know this isn't our usual story, but seeing how it was Porsche themed, we just couldn't resist. It's nice to know that with all the crap going on that people like Russ exist and spend their time, money and energy to do the right thing. Want To See How The Porsche Cayenne Platinum Edition Is Made? Love reading stuff like this. Way to go Russ! I put sunflower seeds out in my backyard for a bunch of squirrels each and every day and have been doing this for well over ten years!! !